You can do up some serious muni courses in Chicago. For a kid born and raised in a small town where the only sniff of bent grass came from a private country club, Chicago is quite a playground. I was lucky enough to grow up on the fourteenth green of such a private club in an isolated town inconvenient to an urban center; I value that greatly and am thankful to my parents for giving me the opportunity to learn the game in such a great setting. But as an adult, with my own car, and mostly free Saturday mornings, I wouldn’t trade the diversity and choice of Chicagoland golf for anything. I value this greatly and am thankful to my wife for letting me have most Saturday mornings as me-golf time. Hey, just thanking the people that matter. But I also mention this because we Chicagoans need to cherish what we have here. I know it’s tough to cherish things when your round is approaching five hours or a traffic jam threatens to make you late for your tee time. Let’s try though. You gotta take the good with the bad. Schaumburg embodies what I’m talking about. It’s 27 municipally-owned holes packed in to a middle class suburban setting with near-country club conditions and a challenging layout – all very approachable. Solid course, competitive price, and great conditioning. 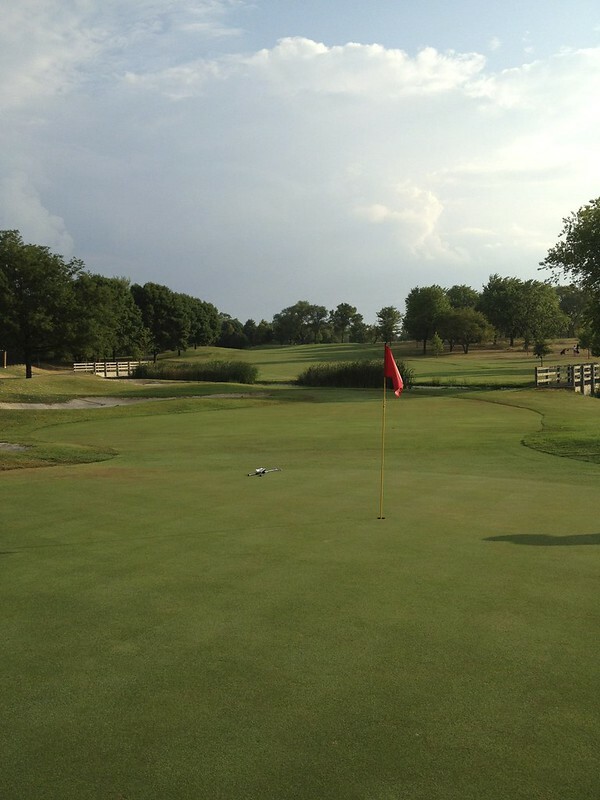 Even amidst this drought-stricken summer and despite the tremendous amount of play it gets, Schaumburg’s greens were smooth and the fairways lush and well-defined. The grounds crew at this place deserves some serious props. Now it did cost $69 with cart, we waited every shot on the back nine, and there were occasional conditioning trouble spots (because of weather I think), but to me this golf experience leaves nothing to be desired. That’s how I am. I love the layout. When the park district bought it in 1989, they brought in Bob Lohmann for the redesign. Lohmann is a prolific regional architect whose most famous project may be the Merit Club. You don’t know which of Schaumburg’s two nines you’re going to draw unless you check the rotations online, I rarely check though because Lohmann made them all very comparable. The Baer stands out in that it has three 400+ par fours, with the potential for a long, punishing finishing hole if they put the back tees all the way back, which I’ve never seen. This boosts the rating/slope for any combo that includes Baer. Pictured at the top of this post is the par four first hole of the Baer course (10th for me on this day). It’s a nearly 400 yarder with water right, a sloped fairway, and a huge green. It’s a challenging hole but also a beautiful setting. You get panoramic views over the lake of the fourth and fifth holes on the Tournament course, and then enjoy a great walk to the next tee box that takes you out into the lake for a waterborne drive. It’s the most beautiful part of the course in my view. Your tee shot on this hole is slightly elevated and slightly blind (I think they need an all-clear bell of some sort). It originates from a tree lined pocket by the course entrance. If you hit it solidly, you can benefit from the downhill, which is important, because the shorter iron you have in to the green the better. The approach is to a well-bunkered green also guarded by a canal that is overgrown with vegetation to add to the intimidation factor. The hole is situated adjacent to a busy suburban thoroughfare (Roselle Road), but you hardly notice. It feels like you’re a thousand miles from suburbia. Besides the 27 holes, Schaumburg has a well-appointed clubhouse with locker rooms and party space. The restaurant has a great burger too. They also have a grass range, a learning center, and seasoned staff who keep play rolling along decently. Even though I only play here one or two times a year, I keep my handicap here and kind of call it my home course. It’s often difficult to get a morning tee time on the weekend because of the permanents, but there are a fair amount of cancellations, so keep calling. Play it, you’ll love it. Here’s my scorecard. 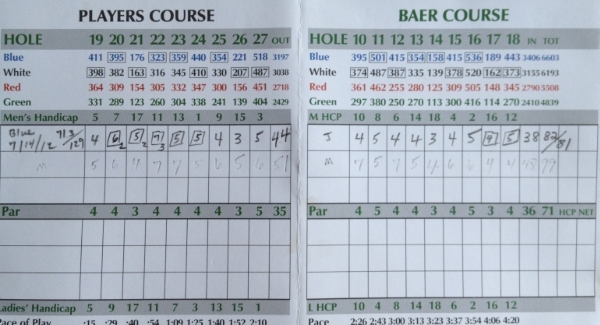 Started really ugly, but those ten straight pars made for quite a party. 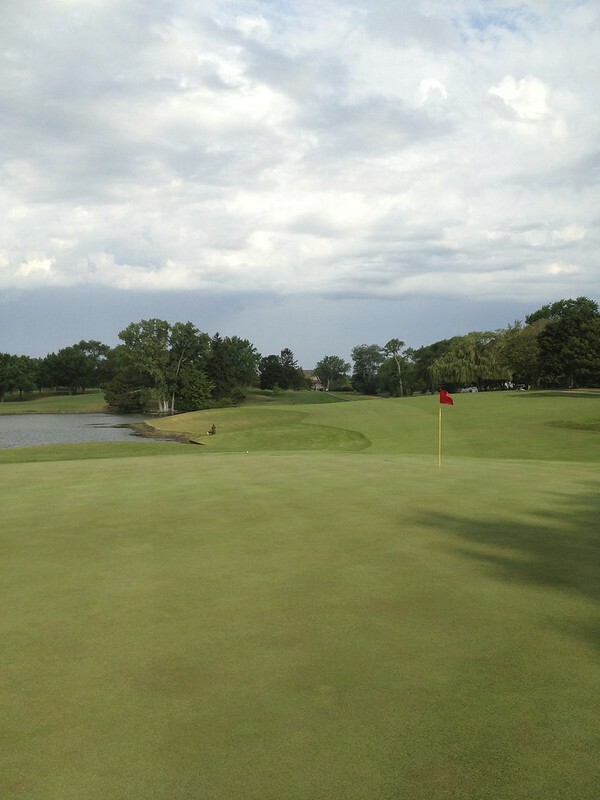 Posted in golf on 2012/08/01 by John.